Comedian Will Nolan returns to The Green Room 42 on April 11 as everyone's favorite Jesus-loving, Kelly Clarkson-worshipping senior citizen redneck lesbian diva, Leola, in Deeper Into Lady Land!. In the new show, Leola explores the Gospel according to Kelly Clarkson, and so we asked Leola to share with us her favorite five cover song performances by Queen Kelly. 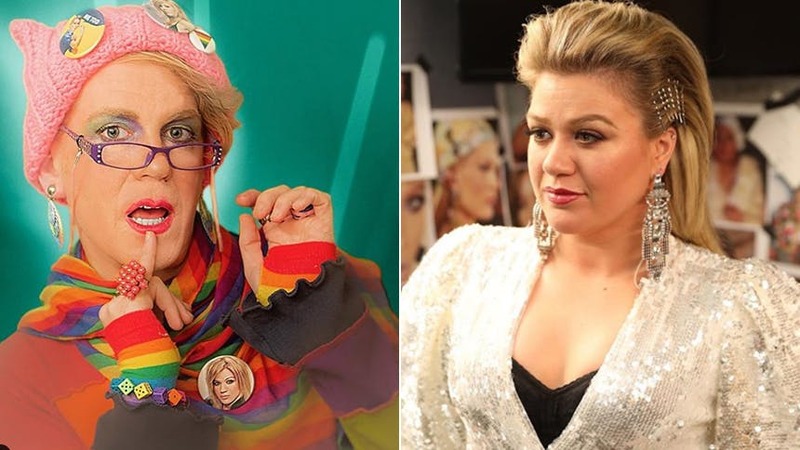 I just couldn’t be happier to share my love of Kelly Clarkson with the readers of BroadwayBox. I realize I may be the first 72-year-old, senior citizen, redneck, lesbian to be given this task and I take the responsibility very seriously. I also take my mission— to heal this country through my sermons at Green Room 42, one audience at a time via the gospel according to Kelly Clarkson—very seriously too. The world is so divided these days, but I think the one thing we can all agree with is Kelly Clarkson is a voice to be reckoned with. Even if you don’t care for her style of music (SAD! ), you can’t deny the talent oozing out of her every pore. When I was just a simple gal of 70, not yet out of the closet but anxious to dive head first into the lady pond, it was Kelly’s music, lyrics, and voice that gave me the courage to be my authentic Leola. She’s empowered us for almost two decades with her angsty anthems and power ballads. And with a hit tour, two winning seasons on The Voice, and a talk show hittin’ this fall, I think she’s just getting started. But it’s not just her own music that preaches to the wanderin’ soul. A regular fixture of her live performances is singing cover songs by some of the biggest artists in the world…and usually better than the original, just sayin’. So BroadwayBox friends and soon-to-be friends, I share with you 5 essential KC covers you should add to your playlist or your mix tape or however you digest your music, if you want to worship with your Leola at the House of Kelly. This was it y’all, the song on that very first season of American Idol when Kelly broke away from the rest of them amateurs and said to the world, “I’m here to slay.” This tiny Texas girl opened her mouth and sang like a one-woman gospel choir. You don’t take on Aretha Franklin. You just don’t. It’s an unwritten rule, like don’t cook with roadkill that’s more than a day old. But Kelly’s performance, especially at the end when her voice runs back and forth from one end of the trailer park to the other, her performance is a perfectly made casserole, whettin’ my appetite and nourishin’ my soul. She’s young and she doesn’t have the confidence and control that she has today, but the foundation is there. A soul legend trapped in a 19-year-old. And that outfit? Usually I’m not a fan of boys dressin’ like girls and vice versa, but she’s got me feelin’ all the Annie Hall/Diane Keaton feels. Grab a hankie before you listen to this y’all! I remember the first time I heard this Hamilton cover from Ms. Clarkson. I was driving to the Piggly Wiggly to cover my shift at the deli when all of a sudden my Sirius Broadway channel shook me to the core. I’ve always loved the Hamilton—I love everything that Lin Manual gal has done. Her music makes me pop and lock, which as a 72-year-old with a bad hip and hammer toes can be tricky. Combinin’ Kelly Clarkson with Lin Manual, well I just didn’t know if I was gonna be able to take it. And then I heard those lyrics and the heartbreak in Kelly’s voice. It’s a song about loss, and then it becomes a song about pushing through in spite of tragedy. As a parent, your greatest nightmare is losing a child. Legend has it, Kelly was pregnant with her second baby when she recorded this song and her voice, her emotion, well you can tell she was imagining that kind of loss when she was sangin’. That’s what separates someone who can sing and someone who can SANG. The storytellin’ that is conveyed in the performance. I don’t have kids myself—my lady land was closed before it even opened. But I feel like I know what it’s like to be a parent. My cats (June Carter Cash and Tammy Whynot) well they’re my babies and Lord knows when they leave this earth, it will be quiet uptown. In my trailer park. This has Reba singing Kelly with Kelly and Kelly singing (a lot) of Reba with Reba. I mean, just grab a rusty ol’ fork and poke me in my nether regions —I’m done! Christmas came early when just last month everyone at the Nashville tour stop of Kelly’s Meaning of Life Tour was surprised by Kelly’s special guest, country music superstar and her step mama-in-law Reba McIntyre. These gals sing Reba’s hit song about a prostitute named Fancy so beautifully, I considered hookin’ myself. There is so much love and admiration between these two legends, it makes me so jealous I could spit. The only thing my step mama-in-law and I ever shared was herpes (long story) and a subscription to TV Guide, large print edition. Kelly and Reba share incredible voices, incredible stage presence, and in this mash up of hits, you hear their ability to blend and complement each other like a two-person symphony. When I saw The Greatest Showman, I honestly didn’t know what the big whoop was. The music is a hoot and I love Wolverine and that gal from Dawson’s Creek in pretty much anything they do. And Lord knows that boy from High School Musical is easy on the eyes, even these ol’ cataracted, lesbian eyes. But the ‘freaks’ didn’t seem that odd to me. Bearded ladies, conjoined twins, tattooed faces, a giant, and a little person? That’s just Sunday dinner at the trailer park for me. (I wonder if I could make some money off of them?) Kelly Clarkson doing a reimagined version of the power ballad “Never Enough,” though—that is other worldly. The song is built for a voice like Kelly’s. It’s a slow build, in her lower register that seems pretty enough. But then, then it soars. She takes you up emotionally with every note, every emotion, every time she says ‘for me,’ until the end of the song, when she drops you gently back to earth with a final ‘for me.’ And I feel like it was for ME, and it was never enough. See what I did there? This is baby girl’s mic drop y’all. This. Is. It. Millions of folks—maybe even billions, who knows!—watchin’ from around the world and our first American Idol could have choked. She could have just played it safe and sung a coupla her hits, a splash of “Since U Been Gone” & “Stronger,” done. But no. She decided to show the world that she can sing songs by Kendrick Lamar, Shawn Mendes, Bruno Mars, Sam Smith, Imagine Dragons, and Taylor Swift, IN FRONT OF Kendrick Lamar, Shawn Mendes, Bruno Mars, Sam Smith, Imagine Dragons, and Taylor Swift…and in some cases, better. She pops, locks, bounces, and flounces her way through the year’s pop hits and when it was all over I didn’t care what the Song of the Year was. I just knew I had gone to church and would forever be a disciple of Kelly Clarkson. This was the moment I became a Kelly Clarksist. If you want to laugh even more with Leola, don’t miss ‘Deeper Into Lady Land!’ at The Green Room 42 on April 11.